"Drip, drip, drip...little by little they are dripping out 'disclosure'. Planet 9 makes 60 Minutes - it doesn't get much more mainstream than that." The new story from the UK Express that Steve Quayle linked to on his website Monday morning reports on what appears to be an ancient, medieval castle underneath the ice of Antarctica. Sharing within their story that if true, it would reshape everything that scientists and historians know about humanity's past as it would prove that people once inhabited what has long been believed to be an icy and desolate region, such a discovery could also help confirm 'pole shift' theory. 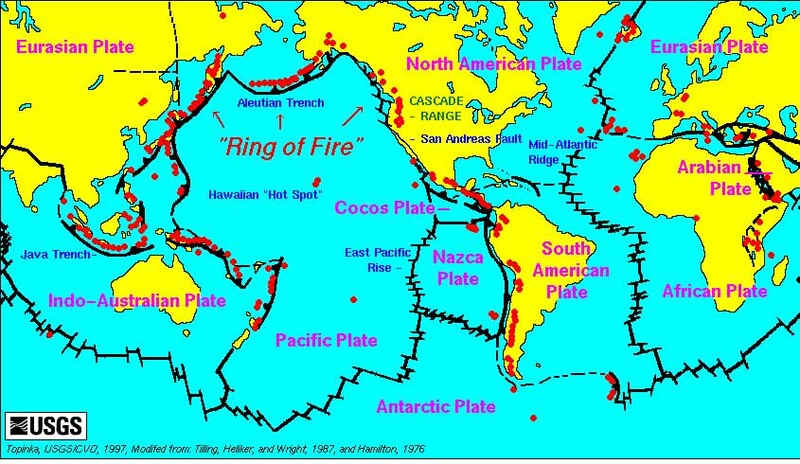 According to Wikipedia, the catastrophic pole shift hypothesis suggests there have been geologically rapid shifts in the relative positions of the modern-day geographic locations of the poles and the axis of rotation of the Earth, creating calamities such as floods and tectonic events. And while such theory might be called 'fake news' by 'the gatekeepers', it would also confirm warnings long given by Native American and Inuit Elders as well as confirming verses from the Bible and the amazing work done by several ancient civilizations such as the Sumerians. And while our planet Earth seems secure in its location here in the solar system, immune from any unknown forces that might give our planet a sudden jolt and send the axis and poles shifting, astronomers across the planet warn that something huge is lurking at the edge of the solar system. 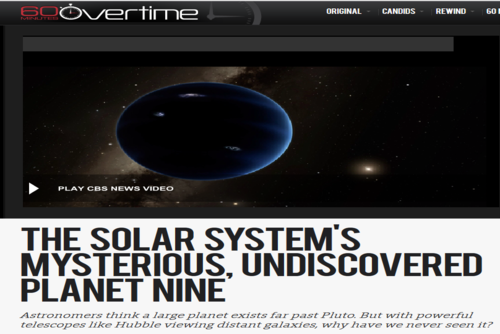 Possibly 10X or more the mass of the Earth, with the gravitational effects necessary to have tilted our sun, 'Planet Nine' made 60 Minutes this past Sunday night and after watching the full episode, its never been more clear that 'the masses' are being psychologically prepared for 'Planet Nine disclosure'. For those who still claim 'Planet Nine' is a 'conspiracy theory', we suggest you listen to the proof being given of it's existence by those who've made their life's work the study of the stars and the mathematical equations that prove something huge is out there. In fact, as far back as the early 1900's, Percival Lowell spent the last several years of his life searching for 'Planet X'. As we asked previously in this story on ANP, if 'Planet Nine' is so powerful, with the gravitational pull that it can tilt the axis of the Sun as also heard in the 2nd video below, what might such a planet have the ability to do to our own little speck of dust in the Heavens over a long period of time? Believed by astronomers to have an orbit so large that it orbits the sun only once every 10,000 to 20,000 years, what might have happened the last time 'Planet Nine' came around, thousands of years ago? As we see in the graphic above taken from the 1st video below, it's believed that at its present point in 'Planet Nine's' orbit, it's about half the way through it in relation to the sun and the Earth. If it has the gravitational power to tilt the solar system and the sun, what happens when it comes back around? According to Inuit Elders, the Earth has shifted. Much more in touch with their reality as 'people of the Earth' than most modern-day zombies attached to their cell phones, the Inuit's warnings to us echo Susan Duclos' most recent story on ANP that something very strange is happening worldwide and our planet going through tremendous changes. The earth has shifted, tilted or as they put it, "wobbled" to the north and they all agree "Their sky has changed!" The elders maintain the Sun doesn't rise were it used to, they have longer day light to hunt and the Sun is higher than it used to be and warms up quicker than before. Astronomer Mike Brown is known as the man who killed Pluto after discovering that there are hundreds of 'Pluto-sized objects' in the solar system at the outer edges. The international astronomy association voted unanimously to downgrade Pluto from a planet rather than declare hundreds of new planets to be in existence in our solar system. Mike Brown is also one of the two men being credited with the 'discovery' of 'Planet Nine'. The other person is an astronomer from Cal Tech by the name of Konstantin Batygin and in the first video below, we hear Konstantin sharing with us the mathematical proof that something huge is out there in space. Something that they appropriately nickname 'the perturber', he proves to us that this search for 'Planet X' goes back to the very early 1900's and extended into the 1980's as these stories from the Washington Post and NY Times prove. As Konstantin tells us, the search for 'Planet X' was effectively 'killed off'...or rather 'censored'...as something with a mass 10X that of our planet can never be 'disappeared'. And while much of the mainstream media will call Planet Nine 'fake news' because it hasn't been officially found yet and an announcement hasn't offically been made by the scientific community, the fact that the existence of 'Planet Nine' would answer many of the mysteries and questions that astronomers currently have about our solar system says almost as much as Konstantin and Brown say about the planet's existence: They are positive of it. In the final video below our videographer takes a look at the mysterious domed fort allegedly recently found in the Antarctica that would throw history on its head and prove we know nothing of 'real' Earth history. Warning us in the first video that 'the solar system still has some tricks up its sleeve', we learn the history of the search for 'Planet X' and while some will still call it a 'conspiracy theory' until the day that it is officially 'discovered', those who do the math and study the stars tell us that Planet Nine's existence perfectly answers those mysteries that man has been trying to answer about our solar system for more than a hundred years.